AS OF PATCH 18.7 THIS AREA IS NO LONGER USED. FOR THE STARTER AREA PLEASE SEE: Arete Landing. 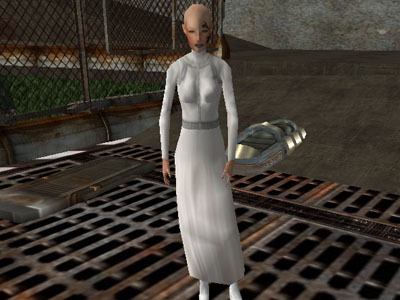 Note: If you had a character on ICC Shuttleport Island, you have not lost that character. You may log in and continue play to remove that character to the main land. These characters can not be transferred to the new Arete Landing area. 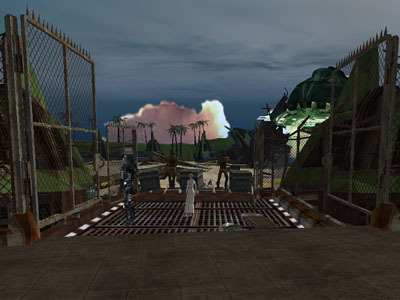 ICC Shuttleport, often referred to as "Newbie Island", is where most people choose to start of their game unless their character is either Keeper or Shade. 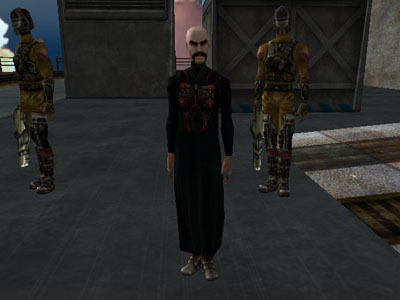 It introduces you to the most basic of basics of Anarchy Online as well as gives you a basic overview of the storyline. 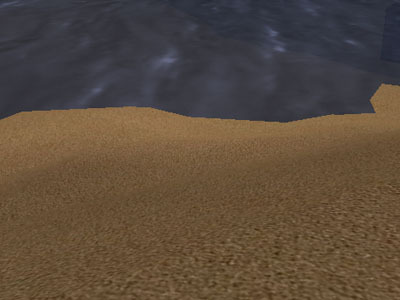 As a new resident to Rubi-Ka your shuttle is shot down by the Kyr'Ozch, you find yourself on the beach of the island and luckily there are several people more than willing to give you quick and easy assignments for experience, credits and other rewards. Without further delay, let us get to the heart of it all... What you can do on the island! The Newbie Island can be a confusing place to navigate. Especially as there are two "levels" connected by a ramp. 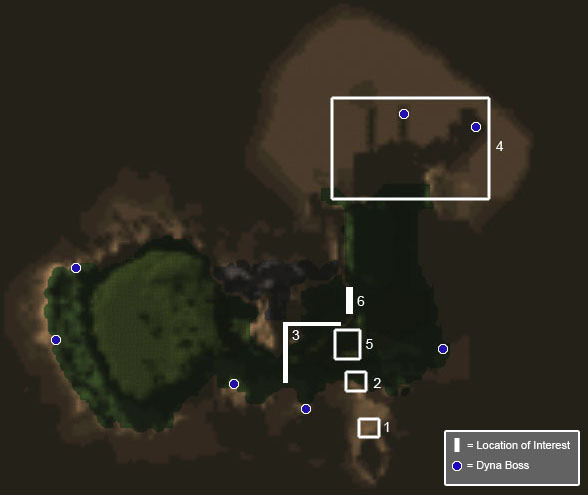 Below are two maps of the two different levels I will refer to as "Beach and Docks Level" and the "Terminal Level" which includes the most important landmarks, areas as well as the Dyna bosses scattered across the playfield. This is where you will find yourself upon starting a new character. 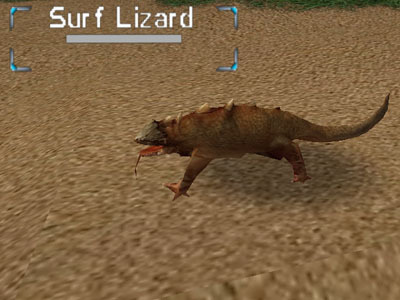 On the beach at the edge of the water, around you are Beach Leets, Island Reets, Shore Snakes and Surf Lizards, none of which will attack you unprovoked. 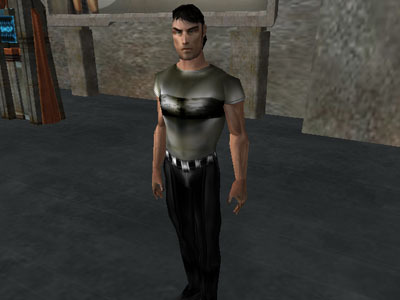 The first person you might see from your spawn point is Brandon Thorn. He is a paramedic that will give you some quick tasks that can net you some XP as well as some useful gear. Also upon chatting with him, he will give you your start up gear. What you get depends on your profession and is listed below. 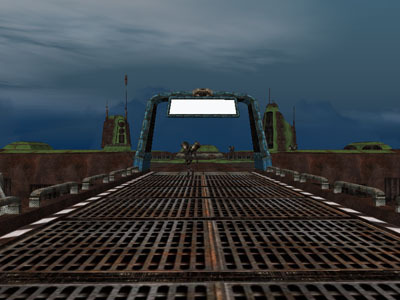 A bit west of your starting location you will see a tunnel, this leads to the Docks as well as to various shop vendors, quest NPCs and the teleport tower to get to the Mainland of Rubi-Ka. 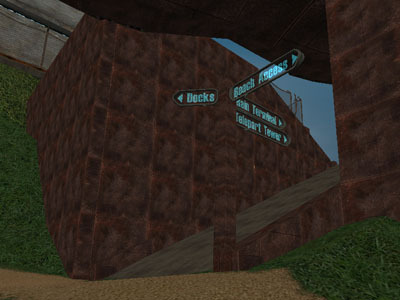 The Docks can be found by going through both the tunnel marked as #3 and #6. 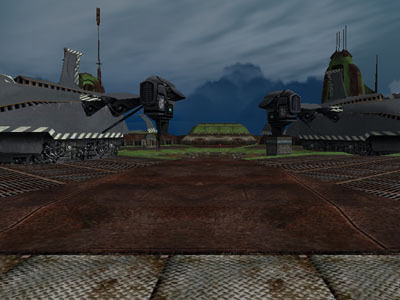 It is heavily populated by droids, robots as well as Kyr'Ozch spiders. I would recommend going here before level 7 to get your Alien XP up to AI2 if you have Alien Invasion. To the immediate right of the #3 tunnel exit is a ramp which leads up to the "Terminal Level". 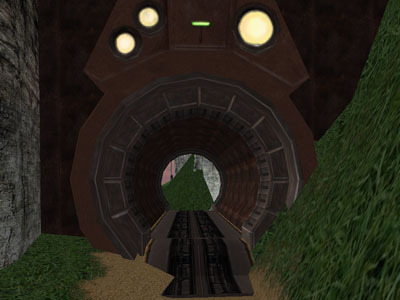 This tunnel leads to the Docks. Around this area you will find plenty of shop vendors, faction recruiters, a few quest NPCs as well as a shop terminal that provide you with some much needed nano programs for your profession choice. 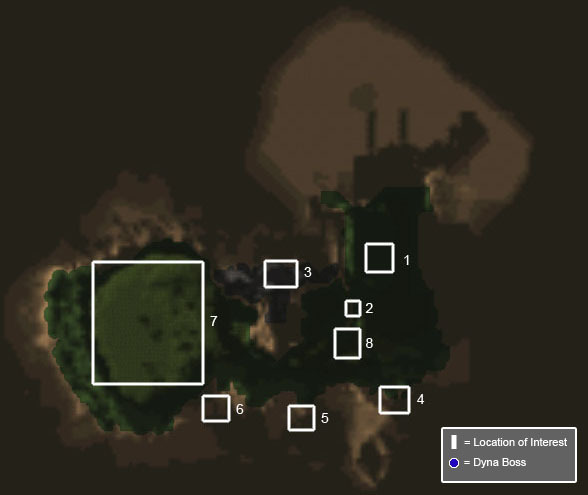 You will find yourself in this area quite a bit picking up missions and gear. At this platform you will find Omni Unicorn Squadleader Fixx and Clan Field Surgeon Elsa Oosta as well as Omni troopers fighting off invading aliens. Manager Travis Molen gives a mission that leads you to these two. 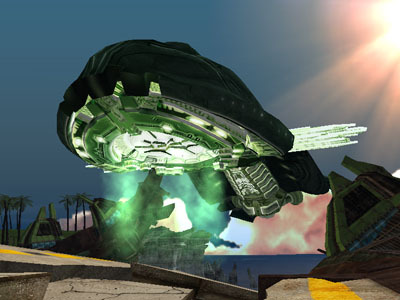 Behind Fixx and Oosta, aliens are invading, coming out from the Alien Ship that is hovering above the island. 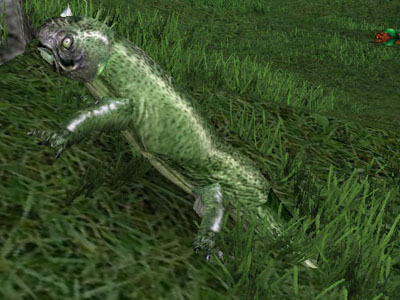 Luckily the Kyr'Ozchs do not attack you unless provoked, so you are in no danger if you do not attack them. 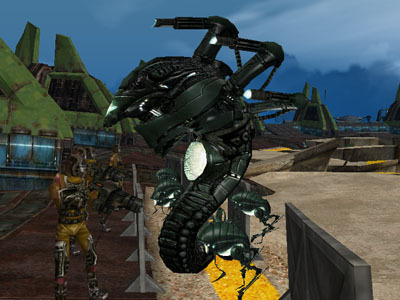 One of the missions Travis Molen gives you includes taking out a few Junkbots. They are located at two platforms, this is one of them. 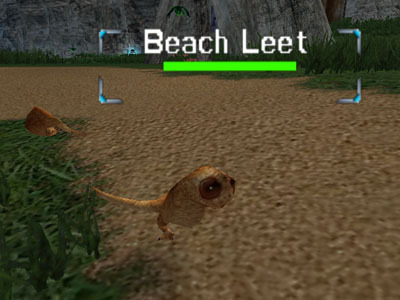 Note that they, unlike most other mobs on Newbie Island they are Social and will auto-attack you if you get too close. 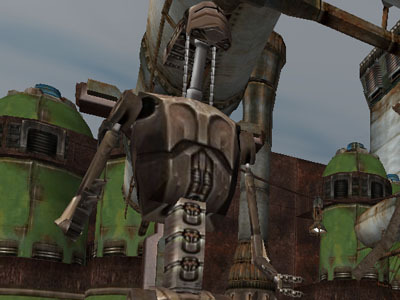 This is the second platform with Junkbots. 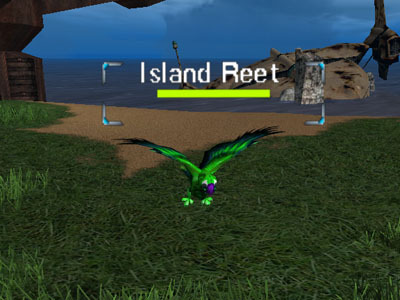 Note that they, unlike most other mobs on Newbie Island they are Social and will auto-attack you if you get too close. 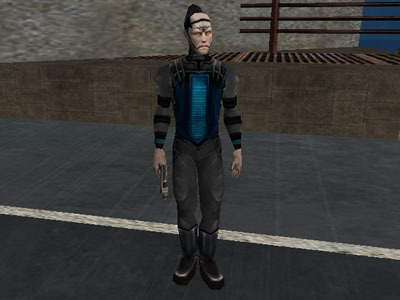 In your mission to get Newcomer's Armor from Travis Molen you are required to kill a Shuttle Saboteur and three Stowaway Rollerrats. Both are found at this platform. 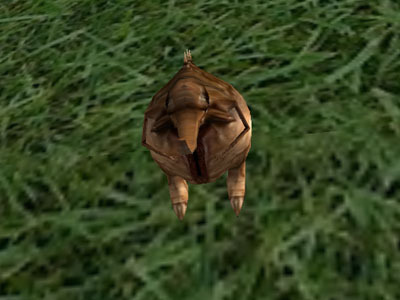 Note that the Rollerrats are social and will auto-attack you if you get too close to them. Travis Molen wants you to take out a few Giant Snakes and Climbing Salamanders. They are located here. 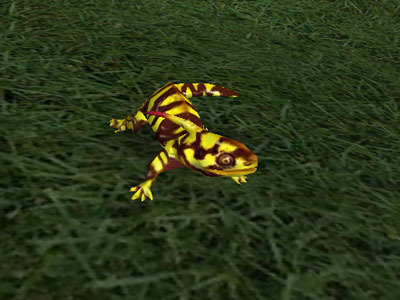 Beware that the Climbing Salamanders are social, meaning that if they see one of their own being attacked they will come to its aid. This ramp is the one which leads down to the "Beach and Docks Level". 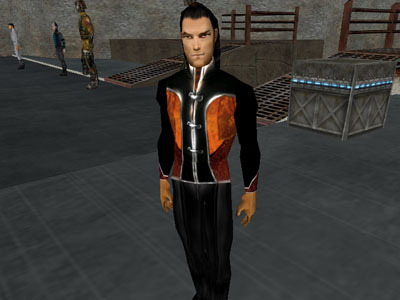 After having a chat with Brandon Thorn located slightly north of your arrival point, you will be given your start up gear. What you get depends on which profession you are, below you can find all the professions' different gear. Note: The weapons you are provided with can be upgraded. Gives you 15 Health Points and 15 Nano Points. Locks out for 40 seconds. Gives you 50 Health Points and 50 Nano Points. Locks out for 15 seconds. Can not be in combat and must be sitting. 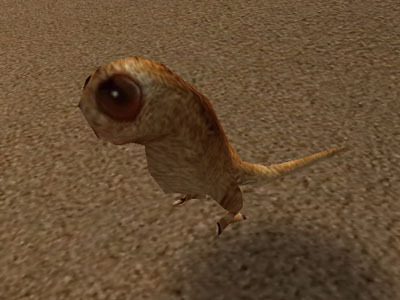 Spawns an MP attack pet. Inflicts 9-23 points of energy damage on the target. Heals the target for 15-25 points. 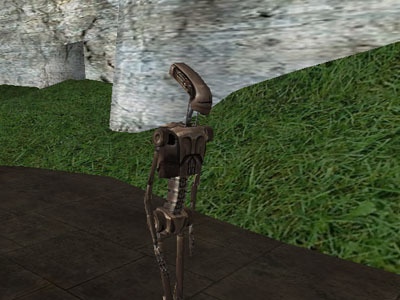 1-Use Item that spawns an Engineer Droid when right-clicked. Increases ranged init by 12 points. 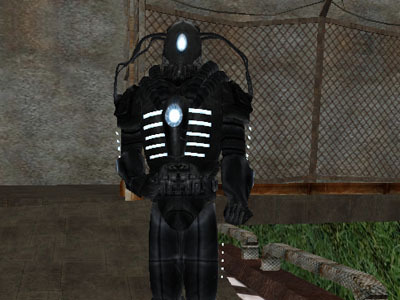 Spawns an Engineer Automaton Shell in your inventory. Pistol weapon that is not dual wieldable before you have upgraded it. Increases the maximum health of the target by 20 Health Points. Sub Machine Gun that is not dual wieldable before you have upgraded it. Increases the target's SMG skill by 8 points and Burst skill by 7 points. Increases all the target's damage types by 1 point. Increases the target's Concealment by 20 points. Heals the trader's team for 11-15 points of health. The trader loses, over 10 seconds, a total of 50 health points. Shotgun that is not dual wieldable before you have upgraded it. Heals the target for 16-30 health points. Damage Over Time (DoT) nano that inflicts 3 points of damage every 7.5 seconds on the target for the duration of the nano. Increases the 1 Hand Blunt skill of the target by 14 points. Dual wieldable 1 Hand Blunt Weapons. Note that you only get one as part of your startup gear. Hits your currently fighting target for 2-4 points of Melee damage as well as taking 2-4 points of Nano Points. Locks out for 10 seconds. 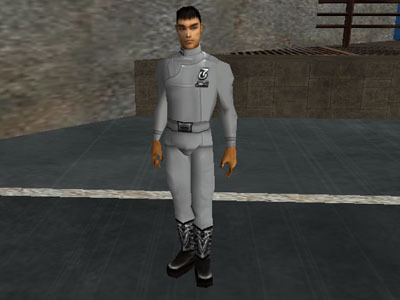 Increases the target's Martial Artist skill by 12 points and Physical Init by 8 points. Hits the target for 13-17 points of cold damage. Roots the target for 15 seconds. When you start a new character, it will always start as Neutral. You can at any time choose to join the Omni-Tek corporation, the Joint Clans or simply stay neutral. Keep in mind that if you do choose a side, it will take some time before you can choose another side, and once you are on the mainland you will loose any Tokens acquired if choose to change faction. Used to switch your alignment to Omni-Tek. The Basic Omni-Tek Token Board. Needs 10 tokens before it offers any modifiers. Grants you permission to teleport from ICC Shuttleport to Rome Blue. Gives you access to the Playfield Maps for some of the Omni-Tek areas/cities such as Rome, Omni-1 and Galway. Used to switch your alignment to Clan. The Basic Clan Token Board. Needs 10 tokens before it offers any modifiers. Grants you permission to teleport from ICC Shuttleport to West Athens. 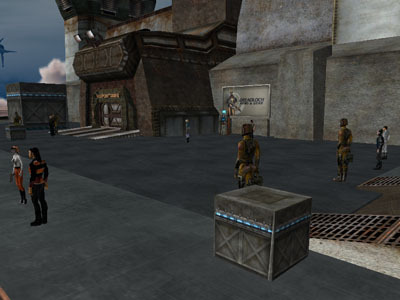 Gives you access to the Playfield Maps for some of the Clan areas/cities such as Tir, Athens and Aegan. Grants you permission to teleport from ICC Shuttleport to Borealis. Gives you access to the Playfield Maps for some of the Neutral areas/cities such as Newland, Borealis and Stret West Bank. In addition to these quests, a whole line of start up quests were patched into the game. These can found Here. Quest Find 4 specific mobs surrounding Brandon Thorn. Quest Kill one of each of the 4 mobs you located in the previous quest. Travis is the Manager of the ICC Shuttleport, and he's a bit worried about the current situation with the aliens attempting to invade it and innocent soldiers being slaughtered by them. He has a few jobs for you if you are interested as well. Kill 5 different mobs around the island. Have a look at Terminal Level map for locations. 300 XP Return with reports from Unicorn Squadleader Fixx and Surgeon Oosta. Look below for more information. Unicorn Squadleader Fixx is a no-nonsense kinda guy. However his men are having trouble keeping the aliens in check and needs you to take out some Alien spiders at the Docks. Note: You must have talked to Travis Molen before Fixx will even speak with you. 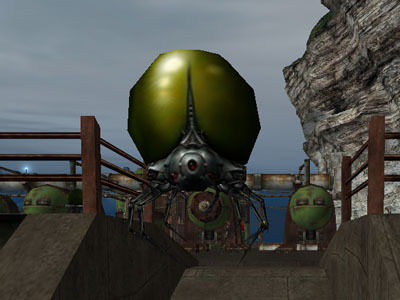 Kill 3 Spiders at the Docks. Elsa has her hands full trying to heal the troops holding the lines. She needs your help. Note: You must have talked to Travis Molen before Oosta will even speak with you. 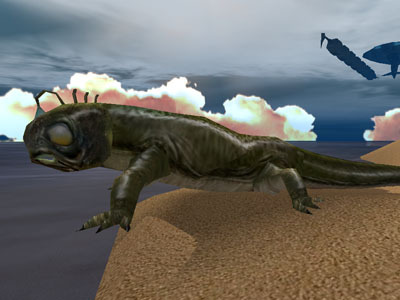 Scan an Alien Spider and then run a comparison scan on a Reef Salamander. To scan them, left click the scanner she gives you, then left click it on the mob in question. Neutrals, Omnis and Clans alike can trade with Antonio. He sells basic weapons, Newcomer's Armor and his Adaption Factory. Dual-wieldable 1 Hand Blunt weapon. Start up weapon for Enforcers. 2 Hand Blunt weapon. Start up weapon for Enforcers. 1 Hand Blunt Weapon. Start up weapon for Meta Physicists. Sub Machine Gun. Start up weapon for Fixers. Dual wieldable Pistols. Start up weapon for Adventurers. Assault Rifle Weapon. Start up weapon for Soldiers. Pistols. Not dual-wieldable before upgrading. Start up weapon for Doctors, Engineers, Nano-Technicians and Crats. Rifle Weapon. Start up weapon for Agents. Shotgun weapon. Not dual wieldable before upgrading. Start up weapon for Traders. Dual Wieldable 1 Hand Edged Weapon. Start up weapon for Adventurers. 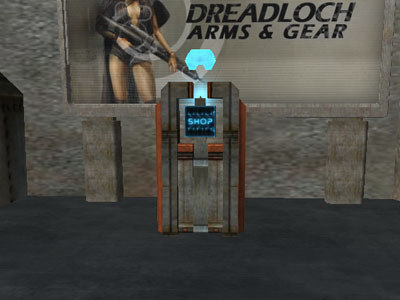 Used for making Improved Solar-Powered Shotgun as well as tons of other tradeskills on the mainland. Note: The Newcomer's Armor Antonio sells (can also be gotten as a Mission Reward) can be upgraded to either Omni-Tek Newcomer's Armor or Joint Clans Newcomer's Armor. These two pieces of armor are so-called "leveling" armor that can go all the way up to QL15, simply right-click it to upgrade it when you meet the Level Requirements. The weapons Antonio sells can be upgraded with the use of various items that drop from mobs around the island. As her name might imply, only Clanners can trade with this vendor. A nice-looking pair of glasses that add to all inits, making you attack faster as well as cast nanos faster. As his name might imply, only Omnis can trade with this vendor. For when those times you wanna party. Not exactly the best armor in game. But it does have one up-side, it looks quite funky! Requires 10 Tokens to wear. At low levels this is better than the token boards. Nice-looking shades that add to inits as well as psychology and perception. Note: This is the most Expensive (and Uberest) item that you can buy on Noob Island. 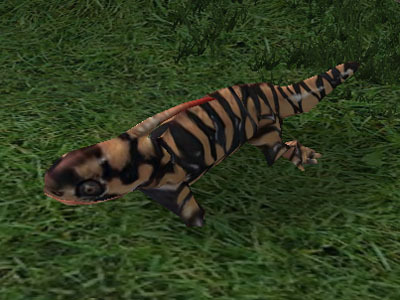 Every player should roll a low level omni toon just to get this item for all your alts! As of the 18.5 patch this item is now Omni only. You can however hack it to make it available for Clan and Neutral use with a hacker tool. 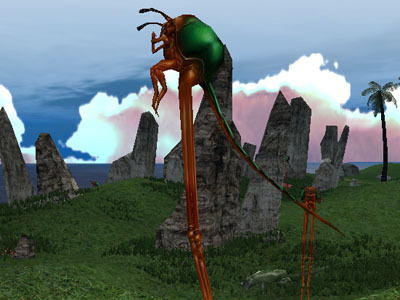 Scattered across the Island are various mobs. Below all of them are listed as well as what they might drop and what it can be used for, if anything. Rubi-Ka mobs only offer regular Experience points. Located around the Beach around from Brandon Thorn all the way west to the Tunnel. You receive 5 credits from the corpse. "Shopfood". Sells for approximately 50-75 credits depending on your Comp Lit. Deliver 3 to Brandon Thorn for a few first aid kits. You receive 1 credits from the corpse. "Shopfood". Sells to shops for 125-150 credits. Located a bit South-West of the Tunnel, along the western strip of the Beach. You receive 11 credits from the corpse. "Shopfood". Sells for approximately 120-150 credits. Note, these will auto-attack you until they are grey to you. Used on Mainland for tradeskills. As well as items that the OT Tailor is looking for. Tirbo Ratcatcher is looking for some of these on the mainland. Located all over the Docks. 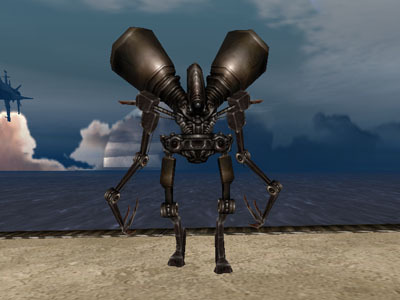 In addition to the Rubi-Ka mobs, there are three different Alien mobs that offer Alien Experience to players which have the Alien Invasion expansion pack. In addition they drop Kyr'Ozch Weapons which again can only be used by players with Alien Invasion. You receive 23 credits from the corpse. 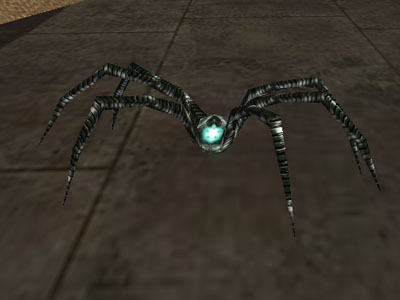 Alien Spiders do not drop anything. Located around the Alien Ship. You receive 66 credits from the corpse. Weapons that can be used by Alien Invasion players. Can be Upgraded to allow use of Special Attacks. 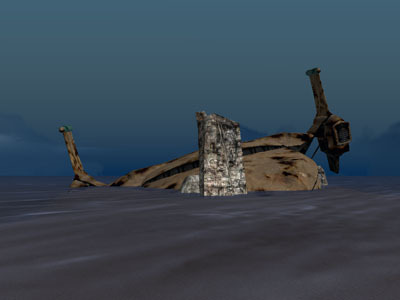 Across the Beach and at the Docks there are several "Dyna Bosses". 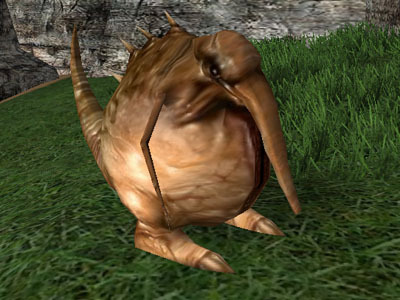 These are bigger, meaner versions of mobs that has a chance at dropping some very nice loot that can be either used by you or sold to the various vendors on the island. Beware that they have a lot more HP as well hit a lot harder than their regular mates. The loot table beneath is split into several sections depending on how useful they are. A fairly useless item, as such it is listed under "Shopfood". Sells for approximately 200 credits depending on the QL and your faction. Pink Rings are used in a few Tradeskill processes, but the QLs that drop from ICC Shuttleport are too low to be useful. Sells for approximately 160 credits. Golden Bracers are used in a few Tradeskill processes, but the QLs that drop from ICC Shuttleport are too low to be useful. Sells for approximately 200 credits. A useless ring. The only thing it can be used for is putting it into a shop vendor and selling it. 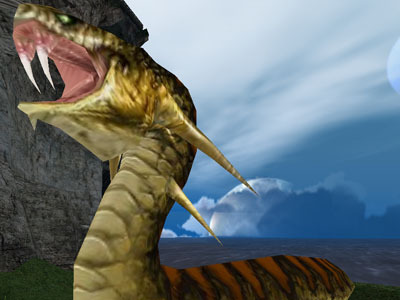 Rings of Thorn are used in a few Tradeskill processes, but the QLs that drop from ICC Shuttleport are too low to be useful. Sells for approximately 120 credits. Golden Spheres are used in a few Tradeskill processes, but the QLs that drop from ICC Shuttleport are too low to be useful. Golden Rings are used in a few Tradeskill processes, but the QLs that drop from ICC Shuttleport are too low to be useful. Marriage Rings are used in a few Tradeskill processes, but the QLs that drop from ICC Shuttleport are too low to be useful. Engagement Rings are used in a few Tradeskill processes, but the QLs that drop from ICC Shuttleport are too low to be useful. Glow Arts can easily be dropped into the vendor of your choice. Toe Rings are used in a few Tradeskill processes, but the QLs that drop from ICC Shuttleport are too low to be useful. Flower Rings might look pretty, but are quite useless. Drop them into a vendor. You can safely get rid of any Silver Pearls at your local vendor for a few credits. 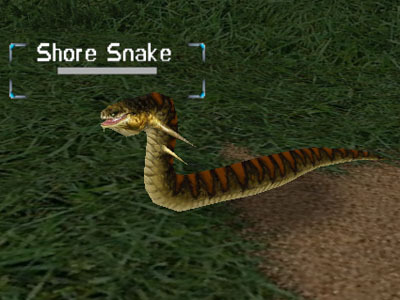 Snake Rings are used in a few Tradeskill processes, but the QLs that drop from ICC Shuttleport are too low to be useful. Sells for approximately 150 credits. These rings are quite handy, the QLs available from the Shuttleport are mostly going to give you +1 damage of a few specific types of damage. Make sure you equip one that adds to the damage type you use. Note that they do not work for nanos. Sells for approximately 250 credits. Rings of Luck are extremely nice. It adds either a few points to your AddAllDef (Defenses) or AddAllOff (Offenses) allowing you to, respectively, evade more shots/hits or hit mobs more often. Sells for approximately 2000 credits. Especially handy for engineers, as it is used to build the Solar-Powered Tinker Pistol. As with the Notum Chip this can also be used to build the Solar-Powered Tinker Pistol. An extremely nice set of armor for Fixers, this adds to your evades as well as to your nano skills. If you are a fixer this is definitely worth picking up. Martial Artists will want to pick up a few of these. Depending on the Combat Suit it can buff nano skills, HP, Martial Arts or evades. An excellent backarmor for Bureaucrats. Some extra ACs, nano pool as well as nano inits to cast your nanos faster. In addition it looks great! An Omni-only backarmor that gives you a bit of tradeskills (including Computer Literacy, which you can never get too much of) and ACs. A definite must for any Omni characters. This section consists of answers to commonly asked questions about the ICC Shuttleport. If you feel a question is missing, please feel free to write a post in the Feedback section of the forums. How do I get back to the ICC Shuttleport? The short answer is.. You can't. 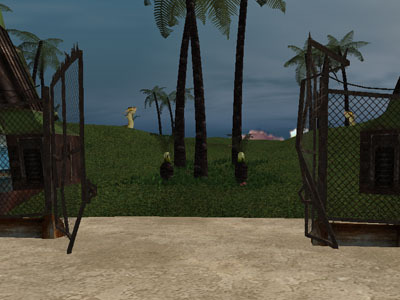 Once you leave the Shuttleport you will be unable to return, so make sure you have everything you need from the island before heading into the Teleport Tower and making your way to the Mainland. What is the max level cap on the Island? As far as I am aware, there is no maximum limit. However you will find it extremely difficult and counter productive to level any further than level 10. There simply is few mobs that offer Experience Points, and those that do take ages to kill as well as offer very little XP. However it is commonly believed that you are kicked off the island when you ding 20. Sadly I am unable and unwilling to confirm this for fear of my sanity. How many Alien Invasion levels can you get on Newbie Island? You can get up to 3 alien levels. 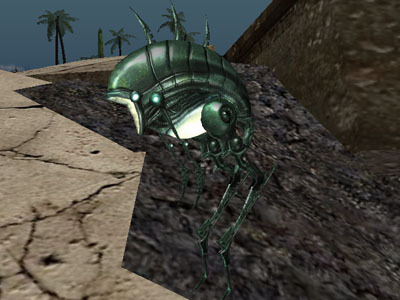 This does however require you to remain on the island until you hit level 15, since only then can you start working on the Alien XP required for AI Level 3. Once you hit level 25 on the mainland you will then automatically get your third AI level. Can I change factions after or on Newbie Island? Yes you can, however it is a slightly complex system, so bear with me while I explain. 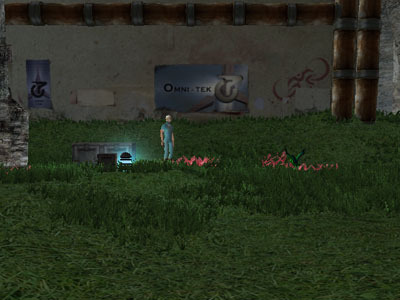 Many Clan players choose to go Omni first so they are able to get themselves an Omni-Tek Technical Library. This requires them to chat with Both the Omni-Tek Recruiter and the Clan Recruiter on the Island Before changing their faction. The reason you have to do this is so that you get both of the Application Forms, as once you go Clan/Omni the Recruiter from the opposite faction will not speak with you or hand you the application form. Another complication is that if you have the Shadowlands expansion pack, you may be required to to have a certain amount of faction with the Unredeemed (Omni) or Redeemed (Clan) depending on the faction you wish to change to. I started playing the game with a friend, but we can't seem to find eachother ingame.. What's wrong? 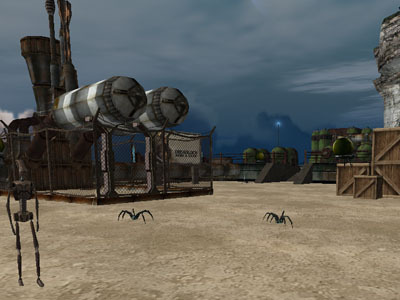 Newbie Island as well as countless other playfields in Anarchy Online are split into several different instances (Or GS as they are referred to as well.) 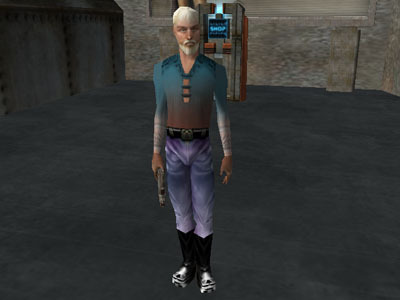 You are most likely in different ones, the best option is to head up to the Teleport Tower which is located by Travis Molen. Inside there are rarely many people, meaning chances are good you will not end up in a different instance. Press CTRL+5 to get your team window up and then invite your friend(s) to team and head out. You will now be located in the same instance and can now have fun together. Where can I buy Health and Nano kits? You can't. There are no vendors that sell it. 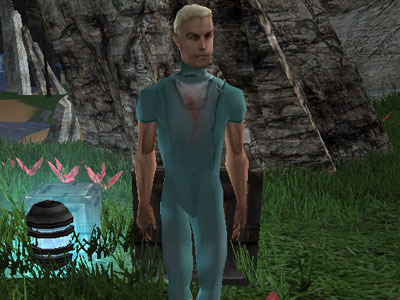 However Brandon Thorn, located very close to where you start the game, will give you the four most basic Health and Nano kits in return for 3 Monster Parts that drop off almost all mobs on Newbie Island. 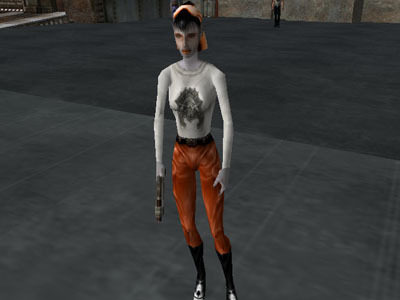 I wish you the best of luck in Anarchy Online, keep in mind that the game has a quite steep learning curve but once you get into the game it is a real treat to see your character take shape and start to really shine. And don't forget, it's a game so go out and have fun! Additional information provided by Fixerspy at the Official AO Forums and Windguaerd.